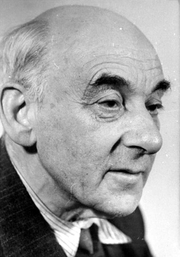 Victor Klemperer was a journalist and professor of literature, specializing in the French Enlightenment, at the Technische Universität Dresden. His diaries detailing his life under successive German states — the German Empire, the Weimar Republic, Nazi Germany and the German Democratic Republic — were published to great acclaim in 1995. His recollections on the Third Reich in particular have become a standard historical source. Prof. Klemperer was born into a Jewish family, and despite his conversion to Christianity, he was stripped by the Nazis of his academic title, job, and German citizenship by 1935. He was forced to work in a factory and as a day laborer. Because his wife Eva was considered Aryan, Prof. Klemperer avoided deportation for most of World War II. On February 13, 1945, the day preceding the now-famous night bombing of Dresden, he helped to deliver deportation notices to some of the last remaining Jews in the city. Fearing that he would soon be sent to his death as well, he used the confusion created by the Allied bombings that night to remove his yellow star, join a refugee column, and escape with his wife into American-controlled territory. After the war, Prof. Klemperer went on to become an important cultural figure in East Germany, lecturing at the universities of Greifswald, Berlin and Halle. Victor Klemperer is currently considered a "single author." If one or more works are by a distinct, homonymous authors, go ahead and split the author. Victor Klemperer is composed of 10 names. You can examine and separate out names.